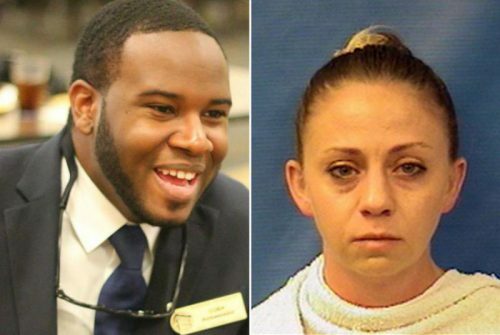 On Friday, a Dallas County grand jury indicted Amber Guyger, who is white, for killing Botham Jean, a 26-year-old accountant who was black. Guyger was off duty but still in uniform when she entered Jean’s apartment. She told investigators she thought that she was going into her own apartment — that the door was unlocked, and that she thought Jean was a burglar when she shot him. Jean’s family has questioned that story. Dallas County District Attorney Faith Johnson says her office talked to more than 300 witnesses in before presenting evidence to the grand jury. “We were determined to present to this grand jury all of the facts, and to clarify for them the law so that they could make the decision that they thought was right and just on behalf of Botham Jean,” Johnson said. Johnson says it could take a year before Guyger’s criminal trial takes place. Johnson announced the indictment alongside Jean’s family. Allison Jean says Guyger deserves to face murder charges for killing her son, who was reportedly watching a football game at the time. “He didn’t deserve it, he was seated in his own apartment, he felt safe in that apartment, and he was violated for her coming in and murdering him,” she said. Jean says she wants justice for her son, but she also hopes that her son’s case can help lead to changes to the way black men are treated in America. “I hope that whatever comes out of Botham’s case that it will be a signal to police officers all over the United States that they need to think before pulling the trigger,” she said. In a statement, Dallas Police Chief U. Reneè Hall listed steps the department has taken since the fatal shooting, including supporting the restructuring of the Citizen Review Board and pushing to exceed basic requirements of implicit bias training. “Every person in the Dallas Police Department continues to feel anguish about this difficult and tragic event,” she said. “We recognize and understand the national discord regarding the relationship between law enforcement and the communities we serve. Jessica Berry was friends with Jean. They were active in the Dallas West Church of Christ. Berry says the indictment will be good news for the church. Guyger, who is white, told investigators that after finishing her shift, she returned home in-uniform and parked on the fourth floor of her apartment complex’s garage, rather than the third floor, where her unit was located, according to an affidavit prepared by the Texas Rangers. She said she got to what she thought was her apartment — Jean’s was directly above hers — and found the door ajar. She opened it to find a figure standing in the darkness. She said she pulled her gun and fired twice after the person ignored her commands. Guyger was arrested on a manslaughter charge three days after the Sept. 6 shooting of Jean, a native of St. Lucia. Responding to criticism that the original manslaughter charge was too lenient, Johnson had said the grand jury could decide on the more serious charge of murder, which it did. Jean’s killing also thrust Dallas into the national conversation on the intersection of race and law enforcement, a dialogue revived by the high-profile trials of officers charged with murder in police shootings. The Associated Press contributed to this report, which is developing. KERA’s Christy Robinson, Rachel Osier Lindley and Eric Aasen contributed to this story. This entry was posted in KRTS News and tagged Amber Guyger, Botham Jean. Bookmark the permalink.